Welcome to the Freedy - Children's Party Entertainer website. I started my first Magic Show in the early 1980's as a teenager, frequently entertaining at children's parties. 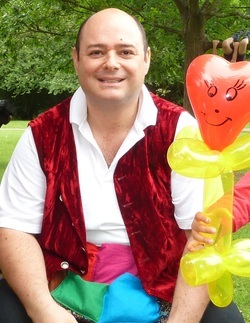 More recently, I've learnt balloon modelling in 2010, that December with snow on the ground I took my twins (a girl and a boy) to a birthday party, due to the weather the entertainer never showed up and with no preparation I stepped in at the last minute to do my first Magic Show in many years. To my delight, several watching parents were keen to book for their children's party and so began the return of my Magic Show. Since then, I have joined and regularly attend The Watford Association of Magician's, I have joined Equity and got actively involved, attending the Equity Children's Entertainers AGM's. I am now very pleased to be getting regular booking to entertain with magic, balloon modelling and let's not forget Ollie the Orange Monster and am having loads of fun along the way. Thanks for taking the time to read my entertaining biography and I look forward to entertaining you soon. 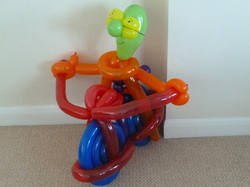 Press "Like" on my Facebook page and mention on your initial enquiry for a £5 discount.